Listen to clues and try to guess the names of the animals that are hiding. How much can a panda eat? Where do different animals like to live? Drag and drop the animals into their correct shapes then wait for the next game to begin. Scroll down and click on a play button to hear an animal. Can you match the babies with their parents? What will these baby animals be when they grow up? What is the biggest land animal? To find more animal facts, click on a video clip in the playlist. Which animals live in the ocean? Where do different animals go when they migrate? Just lift the flaps to discover what, where, which, how and why! 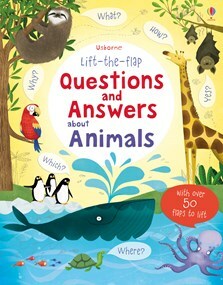 With entertaining illustrations and over 50 flaps to lift and look beneath.